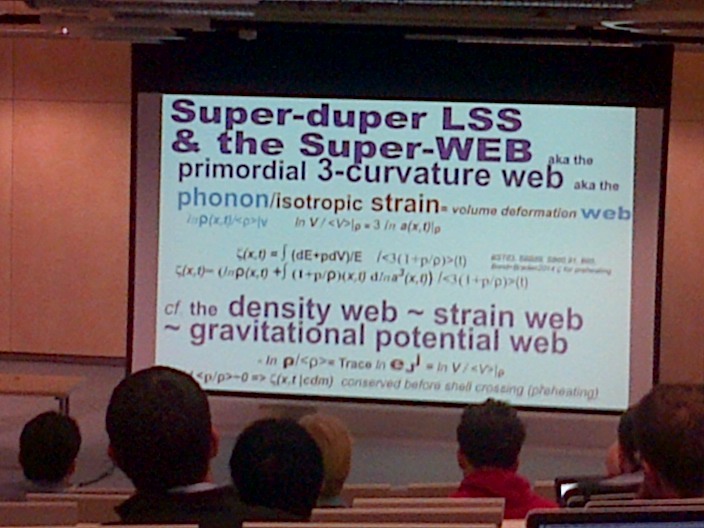 One of the things that makes this conference different from most cosmology meetings is that it is focussing on the large-scale structure of the Universe in itself as a topic rather a source of statistical information about, e.g. cosmological parameters. This means that we’ve been hearing about a set of statistical methods that is somewhat different from those usually used in the field (which are primarily based on second-order quantities). One of the challenges cosmologists face is how to quantify the patterns we see in galaxy redshift surveys. In the relatively recent past the small size of the available data sets meant that only relatively crude descriptors could be used; anything sophisticated would be rendered useless by noise. For that reason, statistical analysis of galaxy clustering tended to be limited to the measurement of autocorrelation functions, usually constructed in Fourier space in the form of power spectra; you can find a nice review here. Because it is so robust and contains a great deal of important information, the power spectrum has become ubiquitous in cosmology. But I think it’s important to realise its limitations. 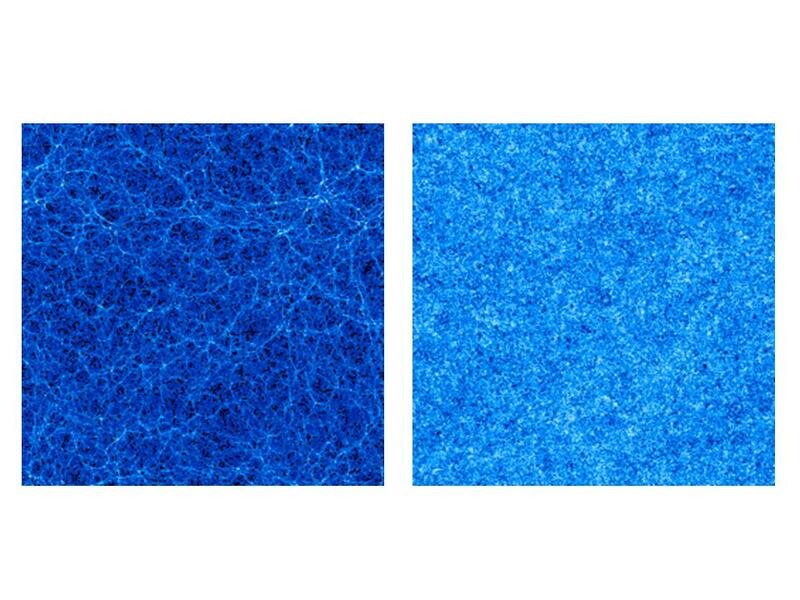 The one on the left is a proper simulation of the “cosmic web” which is at least qualitatively realistic, in that in contains filaments, clusters and voids pretty much like what is observed in galaxy surveys. Anyway each Fourier mode is complex and can therefore be characterized by an amplitude and a phase (the modulus and argument of the complex quantity). What I did next was to randomly reshuffle all the phases while leaving the amplitudes alone. I then performed the inverse Fourier transform to construct the image shown on the right. What this procedure does is to produce a new image which has exactly the same power spectrum as the first. You might be surprised by how little the pattern on the right resembles that on the left, given that they share this property; the distribution on the right is much fuzzier. In fact, the sharply delineated features are produced by mode-mode correlations and are therefore not well described by the power spectrum, which involves only the amplitude of each separate mode. In effect, the power spectrum is insensitive to the part of the Fourier description of the pattern that is responsible for delineating the cosmic web. If you’re confused by this, consider the Fourier transforms of (a) white noise and (b) a Dirac delta-function. Both produce flat power-spectra, but they look very different in real space because in (b) all the Fourier modes are correlated in such away that they are in phase at the one location where the pattern is not zero; everywhere else they interfere destructively. In (a) the phases are distributed randomly. I’m up possibly bright but definitely early to get ready for day two of IAU Symposium No. 308 The Zel’dovich Universe. The weather was a bit iffy yesterday, with showers throughout the day, but that didn’t matter much in practice as I was indoors most of the day attending the talks. I have to deliver the conference summary on Saturday afternoon so I feel I should make an effort to attend as much as I can in order to help me pretend that I didn’t write my concluding talk in advance of the conference. Day One began with some reflections on the work and personality of the great Zel’dovich by two of his former students, Sergei Shandarin and Varun Sahni, both of whom I’ve worked with in the past. Zel’dovich (left) was born on March 8th 1914. 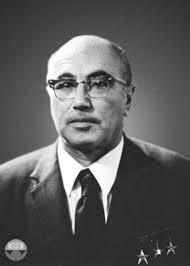 To us cosmologists Zel’dovich is best known for his work on the large-scale structure of the Universe, but he only started to work on that subject relatively late in his career during the 1960s. He in fact began his life in research as a physical chemist and arguably his greatest contribution to science was that he developed the first completely physically based theory of flame propagation (together with Frank-Kamenetskii). No doubt he also used insights gained from this work, together with his studies of detonation and shock waves, in the Soviet nuclear bomb programme in which he was a central figure, and which no doubt led to the chestful of medals he’s wearing in the photograph. In fact he was awarded the title of Hero of Socialist Labour no less than three times. 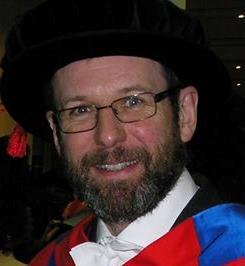 My own connection with Zel’dovich is primarily through his scientific descendants, principally his former student Sergei Shandarin, who has a faculty position at the University of Kansas, but his work has had a very strong influence on my scientific career. For example, I visited Kansas back in 1992 and worked on a project with Sergei and Adrian Melott which led to a paper published in 1993, the abstract of which makes it clear the debt it owed to the work of Ze’dovich. The accuracy of various analytic approximations for following the evolution of cosmological density fluctuations into the nonlinear regime is investigated. The Zel’dovich approximation is found to be consistently the best approximation scheme. It is extremely accurate for power spectra characterized by n = -1 or less; when the approximation is ‘enhanced’ by truncating highly nonlinear Fourier modes the approximation is excellent even for n = +1. The performance of linear theory is less spectrum-dependent, but this approximation is less accurate than the Zel’dovich one for all cases because of the failure to treat dynamics. The lognormal approximation generally provides a very poor fit to the spatial pattern. The Zel’dovich Approximation referred to in this abstract is based on an extremely simple idea but which, as we showed in the above paper, turns out to be extremely accurate at reproducing the morphology of the “cosmic web” of large-scale structure. The Russian version of this review was finished in the summer of 1987. By the tragic death of Ya. B.Zeldovich on December 2, 1987, about four-fifths of the paper had been translated into English. Professor Zeldovich would have been 75 years old on March 8, 1989 and was vivid and creative until his last day. The theory of the structure of the universe was one of his favorite subjects, to which he made many note-worthy contributions over the last 20 years. As one does if one is vain I looked down the reference list to see if any of my papers were cited. I’d only published one paper before Zel’dovich died so my hopes weren’t high. As it happens, though, my very first paper (Coles 1986) was there in the list. That’s still the proudest moment of my life! Well, I must get going for the start of Day Two. The first session starts at 9am (7am UK time) and the day ends at 19.30. Conferences like this are hard work!